With the weather getting nice it is fun to play with everything fresh in the market. 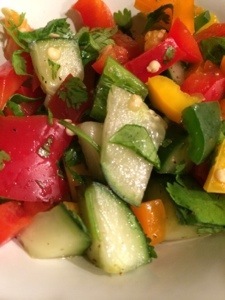 Start by cutting all the bell peppers and cucumber in to small pieces and add to bowl. Remove seeds from Jalapeño and dice small, add to bowl. Chop cilantro, add to bowl and toss. Add juice of the lemon, honey, salt and paper. Combine and allow the whole dish to chill in fridge for an hour. Serve cold. Enjoy!